A delicious hot stew is an amazing comfort food. Having a savory stew in your cooking repertoire is perfect for those times you had a long, stressful day. Our chorizo and chickpea stew is the perfect blend of flavors to help you forget all about it. Your entire family will love this stew, as well. Serving it family-style is a great way to get everyone talking. One thing will undoubtedly come up — how delicious it is. Your kids will love it because it’s so tasty, and you’ll love how healthy it is. It’s packed with protein and vitamins that will give your family the energy they need to tackle the next day. After you make this stew the first time, be ready to make it again soon! Your family won’t be able to stop talking about it. The different textures and flavors of the ingredients blend perfectly together. It comes along quickly, too. 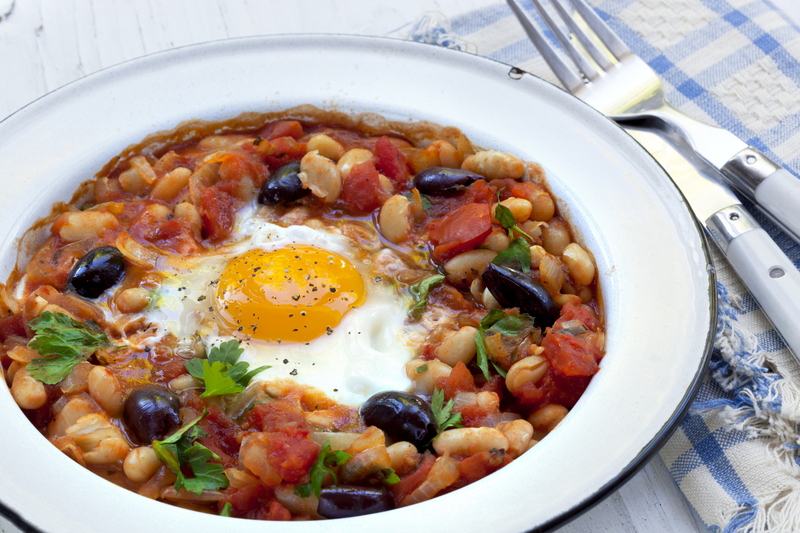 Follow our chorizo and chickpea stew recipe below for your next great family-style dinner! Heat the olive oil in a skillet over medium to medium-high heat until it shimmers. Add the onion and garlic and saute until the onion is tender and translucent and the garlic is golden brown. Add the sausage and saute until it is fully cooked. Add the chickpeas, tomato, chicken broth, thyme, oregano, cilantro, and paprika. Stir to combine. Turn the heat down to low and cook for 15 to 18 minutes. Stir in the spinach and remove it from the heat. Make four divets in the stew and crack an egg into each. Put the stew into the heated oven and bake for 12 to 15 minutes. If the yolk is too runny for your liking, cook it for an additional three minutes. When the stew is finished baking, remove it from the oven and serve it family-style with the sliced baguette. When you cook with Sauder Eggs, you know you’re using a quality ingredient. Our eggs will make any great recipe even better. We’re confident in the premium-grade condition of our eggs because we only partner with farmers who agree that quality is the most important thing. To start cooking with Sauder Eggs, use our store locator to find your nearest grocery store with our eggs in stock.